The complex world of higher education technology can make your head spin: companies make conflicting claims about their products; many products have overlapping functionality; and it is not always clear what different product types actually mean. As a result, deciding which technology solutions are the best fit for your school can be daunting. Since 2014, the first year we published the Higher Education Technology Landscape (Landscape), we have sought to provide clarity to this confusing and fast-evolving world by classifying technology products in a clear and understandable way. Our goal is to make it easier for leaders to make informed decisions when selecting and implementing products. This year, we made two significant changes to the Landscape: we sharpened our inclusion and classification criteria and added new segments to reflect the marketplace today. In addition to providing an updated image and report, we thought we would also give you a brief “behind the scenes” look at our Landscape to provide context and insight into how we select and classify different solutions. 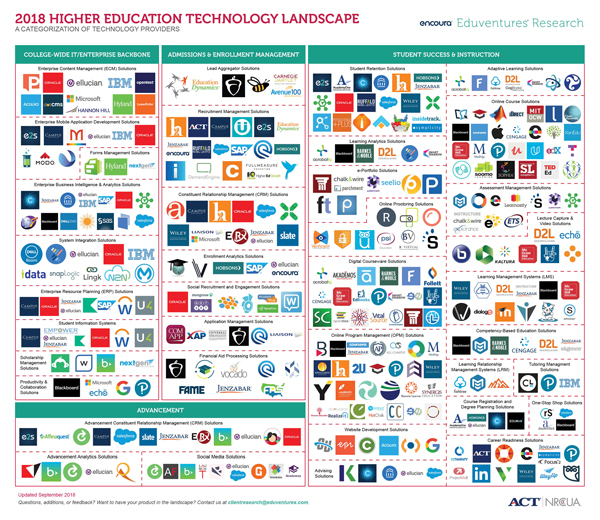 Figure 1: Higher Education Technology Landscape. Click to download high-res image. The most significant change we made this year was to make a greater distinction between products and services. Although some vendors use the terms “product” and “service” interchangeably, they are not: we have focused our Landscape on products only. While this change resulted in a reduction in the number of entries in our Landscape, we think it helps institutional leaders who are considering a product selection better understand the marketplace. Redefining education technology. As in past years, we extend the term “education technology” to include products related to both student success and other areas—enterprise resource systems (ERP), for example—that support critical parts of the student life-cycle, such as admissions, recruitment, enrollment, and advancement. Excluding early-stage companies. We also choose to exclude a number of start-ups and other early-stage companies that have not yet proven their durability in the marketplace. We limit vendors in our landscape to those that have at least one U.S. higher education client and are beyond the incubator and accelerator stages. Focusing on functions. There are two ways of characterizing a product: either by function (what the product does), or by feature (what helps the product accomplish the function). For example, the functions of an airplane are to take off, fly, and land, while the features are wheels, wings, and engines. To classify products more effectively in the Landscape, we characterize them by function. Identifying core functions. By way of example, the core functions of enterprise resource planning (ERP) solutions include accounting management, human resource management, financial management, and purchasing management, and analytics. A closer look, however, reveals that analytics is a supporting function, helping users better perform the other functions. For our landscape, we exclude supporting functions and focus on the core functions to guide classification. Allowing one-to-many classifications. In some cases, the core functionality of a product spans more than one area, such as constituent management systems (CRM) that extend to advising or alumni management. In these cases, products appear in more than one place (or segment) in our Landscape. So, aside from sharpening our criteria, what’s changed since 2017? Which segments of EdTech are under the greatest pressure to change? Which are poised for the greatest growth in 2018? Advising Solutions: Supports students throughout their journeys, supports their decision-making processes for student intervention, and helps manage and measure the performance of academic advising. Functionality includes academic planning and auditing, alerts, case management, career planning, and data diagnostics. Assessment Management Solutions: Collects, manages, and reports data related to student learning outcomes assessment. Functionality includes assessment design, outcomes alignment, data management and storage, and internal/accreditation reporting. This, of course, is only a preview. These and other questions are answered in our 2018 Higher Education Technology Landscape Report published last week. We hope our Landscape will provide sufficient rigor to serve as a tool to better understand the product marketplace. We encourage you to read the report and contact your Client Research Analyst with questions about technology decisions you may be grappling with. As always, feedback on our updated methodology is welcome.